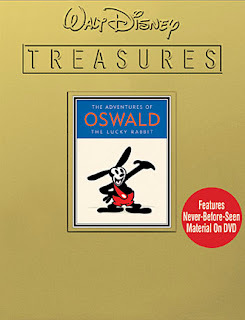 From the Archive: A British Television Blog: Speaking of Finding Missing Material.....Oswald the Lucky Rabbit! Speaking of Finding Missing Material.....Oswald the Lucky Rabbit! Just last week I wrote my article about the missing episodes of Doctor Who. Missing material of all kind intriques me because you never know when something is going to show up. Even something that is over 80 years old! "A long-lost Disney cartoon that features a character who was the prototype for Mickey Mouse has been discovered in a British film archive. The cartoon, called Hungry Hobos, was made in 1928 but has been missing since before the Second World War. The black and white footage features Oswald the Lucky Rabbit and was drawn shortly before the character was abandoned and turned into Mickey Mouse that same year. Incredibly, the five-minute silent cartoon has turned up in a vault at the Huntley Film Archives in Herefordshire, where it has sat for decades. Amanda Huntley, who runs the company, said a colleague stumbled upon it on a shelf and out of curiosity searched its name on Google and discovered it was a 'lost' classic. She said: "There are a lot of lost films out there. This was made in 1928 and has been in our collection for decades. We specialise in social history films and not animation. But my colleague took the film from the shelf and Googled it - I don't really know why. We quickly realised it was one of the great lost films. We posted the news on specialist web forums and everybody was very excited!" Hungry Hobos follows a starving Oswald and his friend Peg Leg Pete on a train. They rob a chicken of her egg by squeezing the animal and cook it by using the train's wheels. Oswald's facial features and behaviour are clearly those of Mickey Mouse - the legendary character that has endured ever since. The whereabouts of the film has for decades baffled animation experts, who believed it would never be seen again. It is now expected to fetch at least £25,000 ($39,000) when it goes under the hammer at Bonhams' Entertainment Memorabilia auction in Los Angeles next month. Hungry Hobos was released for general screening on May 14, 1928, just one day before Mickey Mouse's feature debut, 'Plane Crazy', had its first preview screening. The film marked a significant turning point for Walt Disney as it was the last time he had to work alongside another studio. 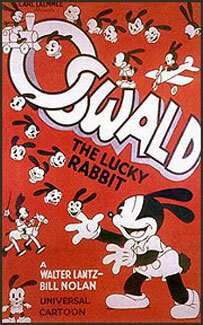 Walt Disney made 26 films with Oswald as the central character for Universal Pictures before taking the character to his own studio and turning it into a rodent. Mrs Huntley said: "It is significant because it is Disney but also because the character was the prototype of Mickey Mouse. Disney developed many characters and they changed over time and Oswald has the characteristics of Mickey Mouse - he looks similar even though he's a rabbit. Disney made a series with this character and then turned him into a mouse. Mickey Mouse has lasted over 80 years and many generations have grown up to love him. How we ended up with the film I don't know. It was probably collected by my father who started the company and it has been sitting on our shelves for decades. We have decided to sell it because it is not really what we specialise in and we can use the money to preserve other films we have". 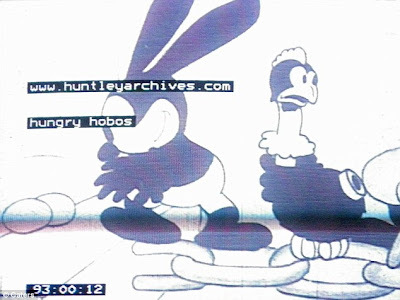 Stephanie Connell, from Bonhams, said: "Hungry Hobos is an incredible find, a lost masterpiece and a cartoon with a unique and vital place in animation history". The film comprises of a 16mm double perforated celluloid acetate positive print. It is being auctioned on December 14." There is reason to be concerned though. Animation preservationalist Tom Stathes says on the Disney forum Ultimate Disney, "I will say on behalf of myself and other animation preservationists that yesterday's discovery of the auction made for a very sad and worrisome day in the archival community. As someone who works in the field of locating and preserving silent cartoons day in and day out, it is fair for me to say that Bonhams has blown the film's value extremely out of proportion, whether or not it is a "lost" Disney film. The results of this auction, whether it is successful or not, could spell problems for the future of our preservation efforts when new "lost" films come to light." I have great respect for Tom Stathes and the work he is doing for animation preservation. I too am worried what the outcome of this auction will be. There has been no word if Disney was offered a chance to buy it or even get a copy. If you have a chance to see any Oswald animation shorts, please do so. They are very funny and make great use visual gags. I prefer them to the early Mickey Mouse shorts. I am worried we will not be able to see this newly discovered short! My article I promised about the episode of Beasts During Barty's Party will be up by Saturday! Where has all the blogging gone?